Here's a nice way to use some of that leftover bird but also make a sandwich that is pretty awesome in itself. Here's the recipe from Nutmegnanny. 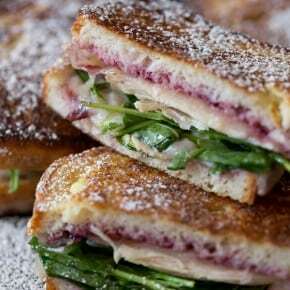 This turkey Monte Cristo is made with cranberry sauce, arugula, leftover turkey and Swiss cheese. Perfectly grilled and gluten free! This is the perfect sandwich for using up all those Thanksgiving leftovers! In a shallow dish whisk together egg and milk. Season with kosher salt and pepper and set aside. Lay out 4 slices of bread and top in this order - 1 tablespoon cranberry sauce, 1 slice Swiss cheese, equal amount of leftover turkey and 1 handful of arugula. Cover the other slices of bread with 1 tablespoon each of cranberry sauce and top the sandwich. In a large skillet or griddle set over medium heat add 2 tablespoons butter. Let the butter melt and get hot. Once the butter is hot dip the sandwich (both sides) into the egg mixture and add to the skillet. The bread slices are small than normal bread so depending on the size of your skillet or griddle you can fit anywhere from 2 to 4 sandwiches. Cook until the bottom is golden browns and flip. If the skillet needs more butter add the remaining 2 tablespoons of butter. When you remove the sandwich from the skillet the cheese should be melted (and the inside of the sandwich will be hot) and the outside will be golden brown. Serve hot with extra cranberry sauce and sprinkled with powdered sugar. I don't know about you but the turkey club on its own is pretty delicious but this is a simple way to take advantage of those leftover turkey slices and creating a new version of a classic. The recipe is from Oh sweet basil.com. Spread cranberry mayo on all six pieces of bread. 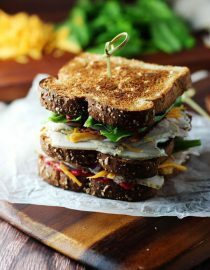 Pile ¼ of the turkey onto two slices of bread and top with lettuce, followed by 2 slices of bacon, cheddar cheese and red onion. Spread middle piece of bread with one ounce of cream cheese. Top with turkey, followed by lettuce, bacon, cheese and red onion. Hopefully these worked out for you because that's just the tip of the iceberg . There are more recipes to come !